I do really love the new Delicate Lace Edgelits. I have used them here to create an unusual but pretty little card and just look what I did with the envelope !!! The Edgelits are the perfect size for using with Stampin' Up!s Note Cards and Envelopes. They are definitely one of my current favourites from the new Annual Catalogue along with the Floral Frames Bundle, which I stamped, heat embossed and die-cut in Coastal Cabana card stock to create the gorgeous floral frame which is the focal point of today's project. 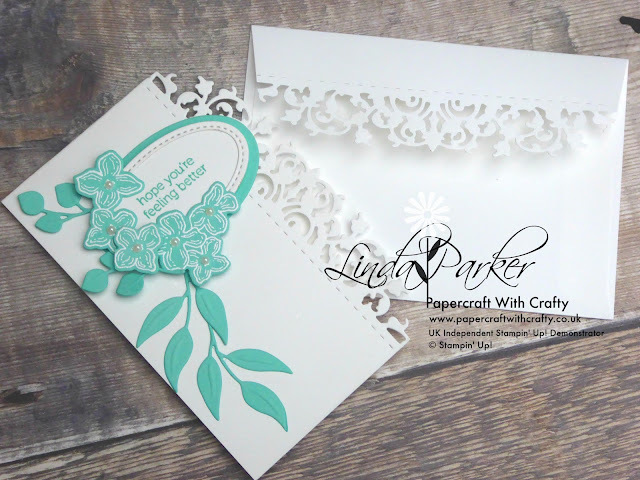 The new Embossing Mats have been a revelation - I never fail to be impressed by the crisp impressions they create in embossing the gorgeous detail on the leafy dies in the Foliage Frame Framelits (part of the Floral Frames Bundle). The sentiment is from the very versatile Itty Bitty Greetings two part stamp set with loads of different sentiment stamps for many different occasions. You can never say you don't have a stamp/sentiment for the right occasion if you own this set. I love how today's little experiment turned out (particularly the envelope - simple things please simple minds). WOW! so delicate and elegant! Very very beautiful Linda, I would be worried if this was to go through the mail as it is so delicate. But if it is to be hand delivered then fine.